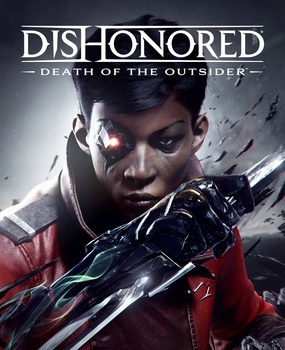 Following the events of Dishonored 2, with Emily Kaldwin sitting back on the throne, Death of the Outsider puts you in the role of Billie Lurk, as she sets out to find her old mentor, Daud and put an end to the reign of the Outsider. Compared to Dishonored 2's massive maps, Death of the Outsider takes place mostly in Karnaca as Billie starts off her search for the dagger that could end the Outsider. Even if the overall game is shorter than Dishonored 2, there are still plenty of things to do in Karnaca and distractions to keep you busy even during the second playthrough. The biggest addition comes in the form of contracts that you can accept in the Black Market, ranging from simple quests such as assassinating a target to more complex ones that require you to visit more than one location and this is where Death of the Outsider makes full use of its map area, encouraging you to explore every corner in order to approach each quest in your own way and find numerous secrets and collectibles along the way. Ignoring everything else but the main quest you could complete the campaign in around six hours, but since the game has more than one ending and once you have beaten the campaign you will unlock the "Original Game+" mode that allows you to replay the game with the powers from Dishonored 2, the campaign is worth at least another replay. Just like Dishonored 2, Death of the Outsider has plenty of secrets, collectibles and documentation scattered across the map, so just like before you might pick up the game for a third playthrough and still find a room that you've never visited before. Without spoiling too much of the story, although the biggest spoiler is already in the title of the game, there's still a lot of context to everything you do and see, and Dishonored has a unique way of expanding the story just by exploring the universe as you will overhear conversations between guards that may lead to valuable information from both a narrative perspective as well as a gameplay one, as some of them will give you ideas on how to approach a situation differently. On top of that for fans of the lore who are looking forward to get more information on what happened between the events of Dishonored 2 and Death of the Outsider, there are plenty of documents and hidden secrets that fill in most of the blanks. Built using the same engine from Dishonored 2, Death of the Outsider, feels, looks and mostly plays the same, but the new powers makes it all feel fresh all over again, even if there's only a few of them, more precisely four: Displace, that allows you to put a marker anywhere within reach and then swap places with it, Semblance that gives you the power to steal someone's identity allowing you to walk right past enemies, Void Strike that is basically just a charged up sword attack that will push your enemies and Foresight which is probably the most useful out of the bunch, as you can leave your body and mark your targets before proceeding forward, allowing you to first take a look around each area and carefully plan your next moves without risking being seen by the enemies. Playing on the Original Game+ Mode is an entirely different experience as those powers will be replaced with some of the powers from Dishonored 2, forcing you to rethink the approach from your first playthrough and opening up new ways to approach different situations. On top of that you still have most of the tools from Dishonored 2 at your disposal, starting with grenades, mines and the new Voltaic Gun that can be used with different types of ammunition. Even though in smaller number, bonecharms are also making a return, but compared to the many varied combinations present in Dishonored 2 they feel like step back in Death of the Outsider as they are limited to basic effects such as giving you more HP or increasing the damage of a specific weapon. Probably the biggest change in Death of the Outsider is the freedom of action without consequences, if in Dishonored 2 each assassination had some sort of outcome later on in the game and there were numerous achievements and rewards for playing stealthy and non-lethal, Death of the Outsider has no such thing, making the whole action feel more fluid as you will teleport from one ledge to the next killing everything your way; the overall design of the missions makes it easier to just eliminate your threats instead of sneaking past them as you will eventually have to come back through the same alley. This is still Dishonored nonetheless, so moving stealthy and using only non-lethal takedowns is still an option, it's just one that for most times doesn't seem like the viable one since there's no reward for not killing anyone or not alerting the guards. Since Death of the Outsider uses a lot of assets from Dishonored 2, it doesn't look that much different to begin with, but the new locations are a joy to explore, although having to go through the same areas multiple times during a playthrough can feel like a chore sometimes, making you wish there were at least a few more locations to explore instead of forcing you to revisit older ones. The visual effects for the newly added powers fit the world of Dishonored well and combined with your tools and equipment you can kill your enemies in quite interesting and unique ways. The character animations are just as good as they were in the previous game and the lip sync and facial animations although not perfect are realistic enough to fit the world of Dishonored. One thing that I absolutely loved about the Dishonored series was the soundtrack, and even though the game still has an original soundtrack combined with a few remixes from Dishonored 2, it's hard to beat the soundtrack of the original Dishonored or Dishonored 2. Just like the graphics, a lot of audio assets have been reused here, from weapon effects to enemy voices, but since the world does look mostly the same, they still belong to the same beautiful world of Serkonos. One playthrough can be completed within 6 hours if rushed, but there are plenty of reasons to replay the campaign a second time including the Original Game+ that will grant you new powers, in addition to the contracts, hidden paintings and numerous secrets that you can find throughout your journey. The overall amount of content is indeed lower than Dishonored 2, but keep in mind that so is the price and the fact that this even has a physical version is amazing and I think we should encourage Bethesda's strategy of creating adequately priced expansions for games instead of DLC and microtransactions. Death of the Outsider is an interesting way to end a trilogy, even though it's not clear that this is the end of the trilogy since it's not called Dishonored 3, but it's obvious that the ending of game will have an impact on the future of the series, one that I am very curious to see. While it may not reinvent the wheel in the same way Dishonored 2 did, Death of the Outsider offers more of that with an interesting new story, so if that's what you're looking for, this game is a must play.